The first thing you have to ask yourself is what is more important, representing the most accurate individual character, or developing a representation of the idea and making it work within the Heroscape strategy game system. I would venture to say that most custom makers are in the middle but some of us fall on one extreme or the other. It really comes down to your fun level so ask yourself if you are into the game to role-play (go with Theme) or for strategy (go Mechanics). I’m a mechanic guy myself. When I create a custom, I think of the uniform the character wears and I start to jot down my ideas as to what represents it. I once told the C3G to consider the image on a child’s lunch box and create your card to emulate that version of the character. Therefore, to the dismay of the “Themers”, I don’t care if my Flash is Barry or Wally, if my Captain America is Steve or James, or if my Green Lantern is Hal, John, Guy or Kyle (although the GL Corps does through a little wrench in my plan). The point is, I’m playing a strategy game with the character that any layman should recognize. The “personality” of the character may end up on the side bar but I don’t get overly involved with adding in extra powers to represent every nuance of every comic writer’s individual impression of the character. Once you’re comfortable with where you want your card’s direction to go, you now ask yourself how do I get it there. Are you willing to take liberties with the established precedent set by the “official” cards? I know the problem is that there are only 10 released “official” Marvel cards so we don’t know if things would have changed, but the system has been laid out. I am one who tries to create cards within the structure and may even be limiting my creativity, but that’s where I choose to go with it. Some of the Custom Rules acceptable by most are the inclusion of secret identities to identify the different versions of the character and the inclusion of the Flying Symbol. Although I understand the desire for these two items, I chose not to go with either on my individual customs. The secret identity goes against my “lunch box” representation of the character and therefore is unnecessary. I can admit that I run into a problem when trying to incorporate characters of the same name so I go against the “Themers” and prefer to get creative within the “official” system. For example, since I have the Human Torch card to represent the iconic character in the Fantastic Four, I had to go different for the Golden Age hero of the same name and decided upon simply calling him “The Torch” (and in fact Alex Ross kind of did the same thing). The Flying Symbol has all good intentions as it allows customizers to really differentiate characters from each other considering most supers have this same flying ability. The problem I have with it however, is the common issue of power creep. Flying may be the most powerful single element in a strategy game with 3D terrain effects. By freeing up the entire left side of a custom, some customizers cannot resist the urge to fill it up with extra thematic powers. Official Heroscape cards usually max out at 2 or 3 powers with an occasional card squeezing in 4. A custom card with four powers and a Flying symbol is likely to be overpowered, overly complicated, or just too role-playing-esque for my blood. By spelling out Flying (or Stealth Flying or any other special movement ability) you are now forced to focus your other power choices on the most iconic representations for your card. It also makes it easier to balance your card with the other cards played in your games. More extreme Custom Rules include the usage of team logos, unofficial "slang terms" used on powers, and peripheral cards for team abilities or extra equipment. These are all wonderful ideas, and if done well, can be a lot of fun. They’re not my style, but if you’re into it you can find great examples out there for inspiration if you know which customizers to seek out. Continuing along the same lines, once you know what type of cards you’ll enjoy making, you have to ask yourself if you want literal representations of character abilities, or simpler methods to represent the same thing. To use my example of my Human Torch again, I built his powers into his stats. His base attack has range and a little “pop”. I felt that this was the simplest way to represent the ability to shoot streams of fire and thus didn’t have to waste space on the card with a Special Attack. You may think that giving the Invisible Woman a really high Defense may be a better way of representing her Force Field. The bottom line is, after I’ve jotted down my ideas as to how to represent a character, I go through a “simplification” process to see how many of those abilities can be represented by base stats or even hit zone pictures. Sometimes I go overboard and the card I make ends up being lame. But I find it is never difficult to add back in a little flavor. By following the “simple” mentality, I hope to avoid cards cluttered with multiple Special Attacks or more than one 20-sided die power. Once you’ve decided on your comfort level for theme, house rules, and details, you’ll now have to decide on your power scale. Do you have a ceiling? Do you want individual characters that you love to be properly scaled with each other? Or do you want the mechanics of a card that you find fun to determine the power level. In other words, do you start by saying I want this guy to be stronger than Captain America but not as strong as Iron Man? If you do, you may pigeon hole yourself with a tight range that you won’t be able to hit. Having a general idea is a good plan though. I believe that the official cards have set nice boundaries by costing the Hulk at 370. Not all customizers agree, but to me that says that no individual draft-able character should be designed with a cost above 400. Anything above that runs the risk of being broken and unbalanced. I don’t like to talk in absolutes, but in my custom world, I’ve placed Superman as that top spot of 400 and worked to balance his abilities to hopefully fit there. All other unique heroes will then be designed with that ceiling in mind. Their may very well be characters that you think are more powerful than Superman and you may want them to be your ceiling. Everyone has their opinion as to the most powerful superhero ever, I just caution creating a custom collection that has no boundary and I really think that the Hulk and Thanos are two cards that need not be exceeded by much. Characters like Galactus would be an exception, but I really don’t think that Galactus is a realistic draft-able character for a player’s army but rather maybe a scenario objective for a solo play mission (when I find the time, that's my plan). This is the most challenging part to consider when deciding on your customs because this is where you really have to decide what other cards you are going to consider in your game. Do you want your cards compatible with Marvel? Valhalla? C3G? NM24 and/or TNT? Any and all customs? I bring this up because when designing customs, you’ll also need to consider names of powers to make sure they don’t repeat with other cards unless they are worded the same (unless of course you're on the far side of the “House Rules” spectrum and you don’t care if two completely different powers share the same name). 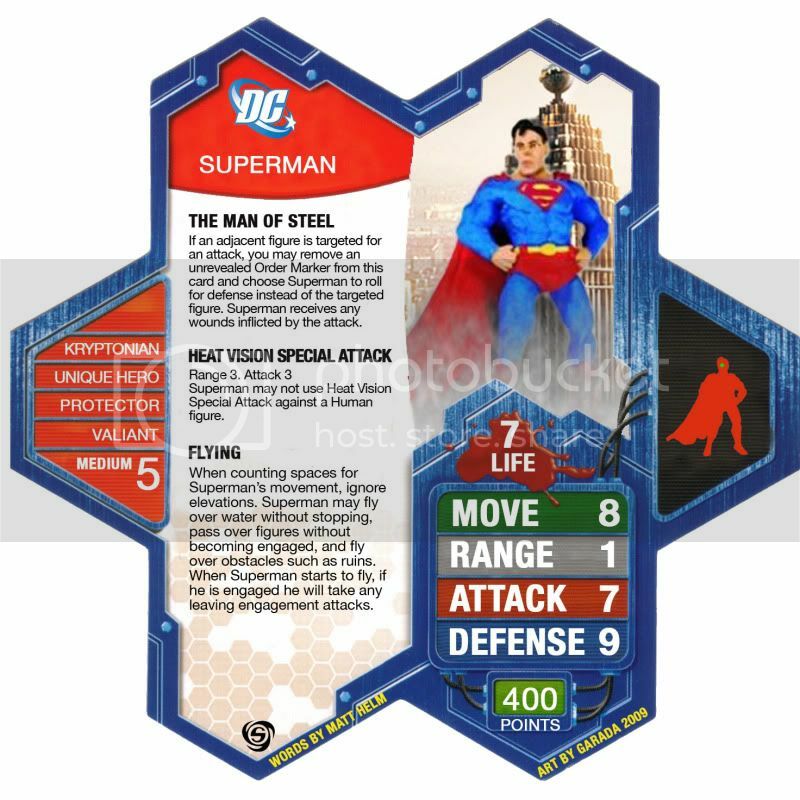 You’ll also need to be aware of commonly used personalities, classes, species and sizes to see what other cards that you use will be affected by this new card's powers. Forethought comes in because if you have a plan for similar powered cards or cards of characters that should bond with other cards, you’ll want to know how to word it right the first time and how to cost that initial card to account for the increase in power level when you finally get to the other. The least important factor but the one that is easiest to notice deals with the look of your cards. I work with A3n who I think creates the closest replicas to the official Marvel cards. Pictures of the minis are used, the border has the brushed metal look, and both the border and banner colors are drawn directly from the mini as much as possible. Font type and positioning is also spot on. At least half of the customizers prefer comic art and some also enjoy alternative textures to the border. Obviously this is all personal choice and just the icing on the cake. I can’t really help anyone make their cards look more eye-pleasing or professional because that’s not my department, but I do encourage you to find someone who makes them the way you like and ask for pointers. Another issue is power positioning. I think for ease of use, the order of the powers can be important. When possible, I try and list the powers in the order that the action takes place in a turn. First bonding bonuses with other cards, next movement bonuses, then attacks including D20 powers and special attacks, and finally defense bonuses. The only regular exception being that Flying (and powers that are Flying clones like Swing Line) should usually be placed on the bottom. Since Flying is such a common power and easily understood mechanic despite its long description, it sits nicely on the bottom and can almost be ignored when referencing a card, becoming second nature during play. Occasionally, due to space restrictions, a Spidey or Venom exception needs to be made, but basically, you can't go wrong with this outline of power order to aid in smoothness during play. Find your fun level with Superscape. Do you want to have 3 different Flash characters on the board at once, each one with a unique feel? Or is more fun to you to limit your speedster customs to one Flash and maybe a Quicksilver for alternate universe combat games. Once you know what you’ll enjoy the most, you can start on a game plan. When straying from official language, watch out for infinite loops. Grungebob opened my eyes to the mirror test (can your card fight itself without creating a paradox?). Loops may include a card that allows you to take a subsequent free turn with another card, and since you didn’t cap the requirements of the second card, you may create an infinite back and forth between to cards taking turns. Avoid power creep by not trying to fit every single possible power on a card. For example, many superheroes have a healing ability as they are fictional characters who don’t spend much time in hospitals and most of them have a survivability factor that will never allow them to die. But this is Heroscape and destroying figures is the name of the game. Allow your cards to have weaknesses when appropriate. Make your stat lines realistic. I know writing a story where Superman is defeated in hand to hand combat by Colleen Wing is ridiculous, but in Heroscape, it should be a possibility even if remote. Creating characters with multiple auto shields or double digit defense dice needs to be looked at a second time. Incorporate your perceived powers into the baseline stats when possible. Supers should be using their customary attacks on a normal basis. It will help you avoid the ugliness of multiple Special Attacks and D20 powers. Flying and Range are deadly together. There is a reason why Iron Man with Flying and a ranged Double Attack only has a base attack of 4. Be mindful of your potential bonuses with height, glyphs or bonding with other cards. Special Attacks are generally “weaker” on the number of dice rolled than normal attacks and can’t be enhanced. When creating powers that aid in defense, consider having them only trigger against your opponent’s normal attack dice. The game is a lot more fun when Special attacks are used to avoid things such as Counter Strike. Name your powers wisely. Powers should not only be thematic for the character, but they should also describe the action taking place whenever possible. It helps establish a base power system for you that can be used on multiple cards (I used Shapeshift Camouflage on both J’onn J’onnz and the Skrull Warriors). It also allows the reader to better understand the action and hopefully memorize the mechanic without having to refer to the card again and again. When designing a power with a wounding ability, use attack dice only in a Special Attack. Use the 20-side die otherwise as it avoids questions of defending figures abilities kicking in or whether glyphs and bonding effects need to be considered. Grungebob turned me on to this point as well and it makes a lot of sense. Avoid combining abilities into a single power unless they are related. As customizers, we are tempted to try and squeeze all of our desired abilities onto a card and sometimes cram in awkward powers where they don’t belong. 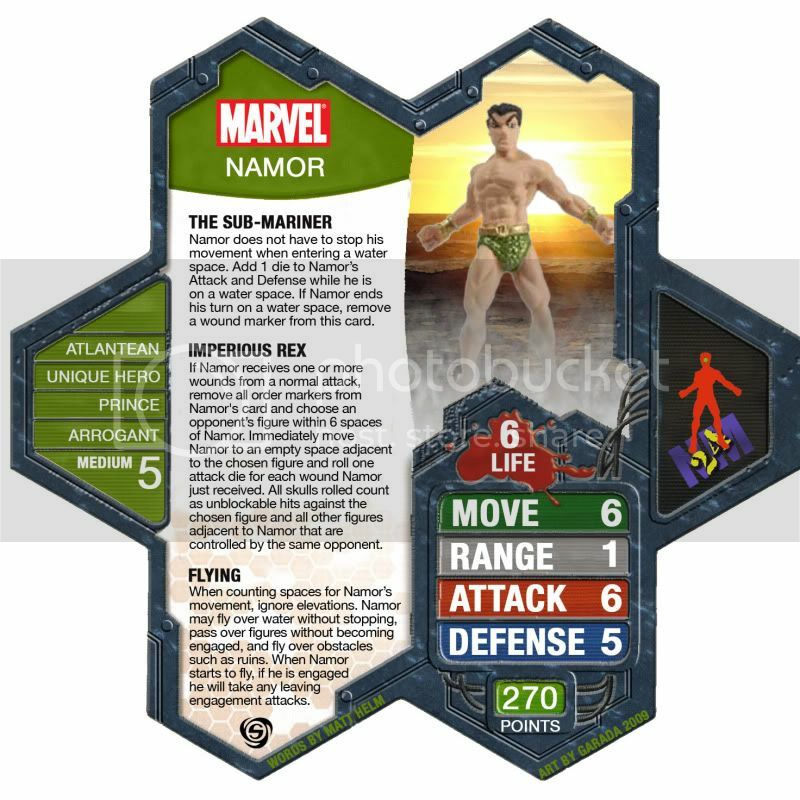 For example, I recently found that my NM24 Namor could be seen as suffering a bit from this so I reworked his “Sub-Mariner” ability and linked his healing and his attack bonus to a single game mechanic, “when he begins his turn on a water space…” I believe I’ve also successfully combined Flying and Carry in Hawkeye’s Skycycle because they are both describing what to do during his movement (and I could just as easily separated them, but I wanted to establish that his ability to fly and his ability to carry were for the same reason). Other abilities don’t belong together and work better separated out. And as I always say, don’t love your own ideas. When collaborating with others, or when soliciting feedback, if someone points out something that’s broken, you should at least take a listen to see where they are coming from. Sometimes the disagreement comes because you and the critic are on opposite sides of the theme scale, in which case, you can take the comments with a grain of salt. Other times someone has found a loop hole in your logic and you may have to rework your idea to get close to what you intended. Be flexible. Very nice! As someone who just started a custom Supers thread, I appreciate the focused topics. Thanks for sharing your creative "skeleton." I've been hearing recently that we've (I've) been chasing people away from the comics customs forum with my "elitism." I'm glad to hear that I'm not crazy in thinking that it's actually growing more and more all the time and has become an awesome playground of custom delights. You need to make sure GreyOwl sees this blog if he hasn't already ... I think he might have "use" for it. I definitely think it is growing, but with the growth comes more diverse ideas and therefore differences in opinion that lead to cries of "elitism". I'm hoping that a blog like this and my new thread that gives all folks (experienced creators, new creators, and fans) a chance to better understand each other, will eventually prevent any future friction. If you're posting on the internet, you better bring your big-boy pants because there will always be opposing posters. If we know where these people are coming from in their train of thought, maybe we can all take it for what it is and leave the emotions in our pockets. A very interesting and insightful read. One of the best blog posts I've ever read. Great work, Matt. This would be a great addition to The Project. Great stuff, Matt! Hopefully between this and "The Project" (sounds ominous, doesn't it? ), we can bring more new customizers into the fold. Love it, made me go back and redo my supers without the flying symbol. Wow, I just love this blog. I disagree with you on the Flying Symbol but the rest of the stuff is good.